The search for the thematic concerns of the current Mifflin group began appropriately enough with a series of potluck suppers with musical, conversational, and image-sharing interludes. We used brainstorming to encourage people to share even fleeting or half-formed images and ideas. In this group, we were impressed early on with the obvious success of the long-standing goal of the Co-op to educate people about the political-social implications of food. We found ourselves learning a great deal about the subject and being impressed with the Co-op community’s clear analysis of the environmental, ethical, social, cultural, and economic issues of food. Jon Pounds and I are particularly interested in extending the legacy of collaboration, which we inherit as artists of the community-mural movement. A traditional method of community collaboration is for the artist to interview the community members about what they want the mural to express, and then the artist or team goes off to work artistic magic and come up with fresh ways of imaging the community’s themes. The assumption seems to be that community members, while able to articulate the issues of their lives, are unable to exercise creative artistic powers to image these conditions dramatically. This division between artists and “regular people” is a fundamental legacy of the modern European art tradition. We began with group discussion, but were committed to developing styles of working that encouraged community members to participate more fully in the artistic design of the project. Over a period of three months, we scheduled Artist Design Meetings. The fifteen people who participated in the design stage were self-selected. They brought to this phase of the project a wide range of artistic training and knowledge. One often hears that “art by committee” will result in bland, impoverished work. This may be true of art by committee, but it is certainly not true of “art by consensus,” which is in our experience promotes work that is rich and varied and accessible at many levels, and draws on and creates a contemporary iconographic tradition. 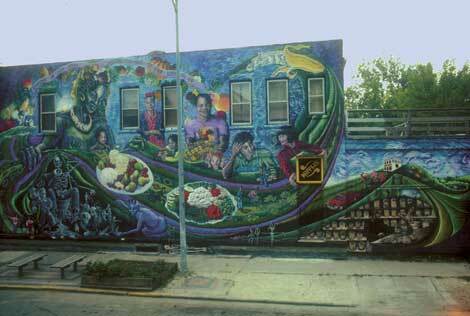 The dominant image of the Mifflin Community Cooperative Mural is a multifaced Nature God/dess spreading a cloth for a feast of life. The feast is, however, a potluck. People come to the feast, not only as guests, but as fellow providers. The tablecloth becomes the ground of life, eventually blending into a verdant, rolling Wisconsin landscape. The cloth, banners, hills, clouds, spirits of ancestors at the feast, and other dominant elements of the composition are arranged to create swirls of line, to suggest the recurring natural cycles of life and sustenance. The gesture of spreading the cloth also reveals underneath the techno-skeletons, a black-and-white image of economic oppression, environmental degradation, and unhealthful food. Community art seems to call for a new aesthetic, an aesthetics of collaboration. Of course, this type of work has ample worldwide historical precedent. What is, perhaps, unprecedented is the twentieth-century community artists’ prior awareness and conscious rejection of an aesthetics based solely on the myth of the individual genius. Community public art thus seems to be a separate genre from more traditionally conceived contemporary public art. It would be well for critics and historians to be attentive to its special characteristics by considering it through criteria generated from within its own imperatives. Like conceptual and performance art, community art cannot be understood fully if it is discussed only within past models of creation. One of the most prominent characteristics of an aesthetics of collaboration is the weaving of diverse images into a unified whole. The goal is not the subordination of the individual, but the harmonizing of alternative visions. The source of authenticity of collaborative work does not come about by paring down to a single essential image; it is created through the accrual of important detail, through the accumulation of varied points of view. Thus, communally designed work extends the promise of the modernist convention of multiple points of view, from representing the fracturing of individual consciousness to the reuniting and reweaving of social, collective consciousness.